Monday, July 30, 6 p.m.-7:30 p.m.
For the cost of a lawsuit, successful plaintiffs can take over valuable, publicly dedicated beaches and access. 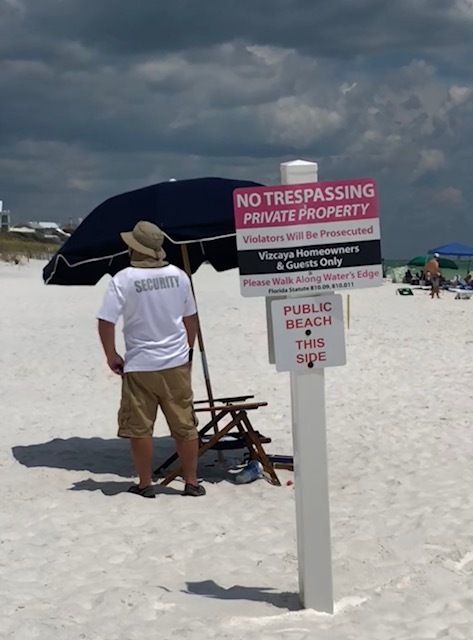 And that’s happening throughout South Walton through a process called quieting title, which along with the Customary Use situation, is limiting public beach access. Attorney Steve Hall, a local land use attorney, will explain the process and its impact during an informational session sponsored by the Democratic Women’s Club of Walton County. The program, “Quiet Title: What, Why and Where in South Walton,” takes place, Monday, July 30, from 6 p.m. to 8 p.m. in the community room of the South Walton Coastal Branch Library. Mr. Hall, Hall & Runnels, P.A., wrote the report “The Quiet Title Process: Who, What, Where and Why in South Walton County” for the Board of County Commissioners (BCC) in 2016. He is currently working with the county on the most recent quiet title lawsuit, in which many Seahighland owners are seeking to take ownership of land dedicated to the public in 1949. Judge Tom McGee, who chaired the BCC’s customary use committee in 2016 and led the Planning Commission, will also participate. If you plan to attend or have any questions, please contact seajayhawk@mchsi.com.